Domo, designed by Antón García-Abril of Ensamble Studio. FISHTAIL, Mont. — At the end of a 90-minute drive from Billings, Mont., through rolling ranchland grazed by cattle and sheep, Tippet Rise materializes like Oz’s Emerald City. North America’s newest and, at 10,260 acres, most expansive art center is buttressed to the south by the snowcapped Beartooth Mountains. In all other directions, the land crests and falls in grassy waves that ripple toward the Bighorn, Musselshell, and Yellowstone rivers and, beyond them, more mountains. At 16 feet high and 98 feet wide, Domo was cast on site with reinforced concrete in an impressive feat of engineering. 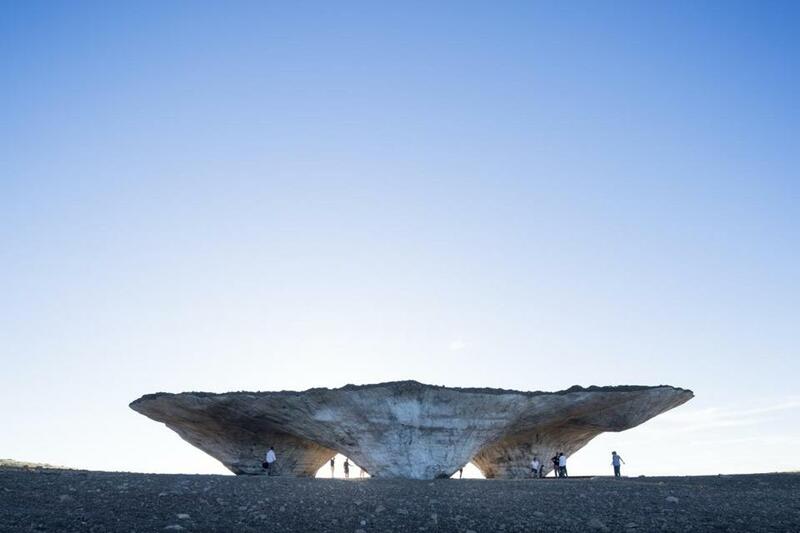 The resulting structure resembles an inverted mountain range floating just above the land. On a distant ridgeline, “Beethoven’s Quartet,” by Mark di Suvero, is made of iron and steel and can be played with a rubber mallet, the sounds reverberating across the grassy folds of land that surround it. The collection also includes works by Stephen Talasnik and Patrick Dougherty as well as the temporary installation of two major pieces by Alexander Calder, on loan from the Smithsonian’s Hirshhorn Museum and Sculpture Garden in Washington, D.C.
Tippet Rise was founded by Cathy and Peter Halstead. Cathy’s father, Sidney Frank, earned his fortune by developing and marketing liquor. Renowned for his successes, he was also known for the large sums of money he gave away — an ethic he passed along to his daughter. Peter Halstead comes from a long line of oil and banking executives; his family was also philanthropic. Today, both Cathy and Peter are trustees of the Sidney E. Frank Foundation, which makes more than 90 grants annually to charities in the United States and England. Friends since they were 16, married 36 years, the two have spent their lives immersed in music and the arts. Cathy is an abstract painter who has shown around the world; Peter is a classical pianist and a poet and, he tells me, he and Cathy have traveled the world together “in search of extraordinary artistic experiences.” Places like France’s Fondation Maeght and the Storm King Art Center in New York’s Hudson Valley helped to shape their aesthetic, values, and appreciation and, with time, a vision began to take shape. Thinking of their grandchildren’s generation, the couple realized that they wanted to create a place that celebrated art and music on a grand scale and on a grand landscape. “We’ve been dreaming of Tippet Rise most of our lives,” Cathy tells me. The couple bought six ranches to create Tippet Rise. And then they hired staff to help materialize their vision, including Christopher O’Riley, a renowned pianist and host of National Public Radio’s “From the Top,” as music director for the inaugural season. To lead the center’s design, they hired Arup, a New York engineering firm that specializes in concert halls. Arup assigned acoustician Alban Bassuet to manage the project. Born in France, Bassuet has designed concert halls and performance spaces around the world. Bassuet says the Halsteads’ vision was compelling. “They wanted to build a place where people could leave behind the crowds of the concert halls and museums and experience art intimately, privately, in the wilds of nature,” he tells me. And so he set to work, orchestrating what would be a long and arduous planning process. By all accounts, Bassuet and his colleagues succeeded — perhaps too well: Tickets for this season’s concerts cost just $10, but they sold out almost as soon as they were released in May. Admission to tour the sculptures is free, but because it is limited to 100 people a day, it can be difficult to gain entry. Tippet Rise Art Center is located outside of Fishtail, Mont., south of Interstate 90 between Billings and Bozeman. To make reservations or to learn more about the Center, visit tippetrise.org. Alexis Marie Adams can be reached at lexy@alexismadams.com.